Birthday Party Ideas - Kids birthday party plans shared by parents around the world to help you plan a kids birthday party. Are you planning a Birthday Party for your son or daughter and can't decide what to do? Should you have a birthday party at home or at some unique location? Birthday Party Ideas provides thousands of party plans with great party ideas shared by parents across the nation and around the world! Its always the right time for a Tea Party. Inside at a special table decorated just so. Or outside under the trees or veranda surrounded by flowers and birds. The villains are on the run and you know that only your little caped crusader can save the day. Better get the Bat Cave decorated, its Bat-time for a Superhero Birthday Party! Looking for the best site on the web to find ideas for your Princess Birthday Party? Check out the ideas shared by parents around the world! Tropical Luau! Everybody loves a Luau and the magic of the Hawaiian islands. So, put on your grass skirt, a hula shirt and some sandals because the Tropical Luau Birthday Party Ideas are all right here! Pirate Party! Shiver me timbers! Ahoy ye hearties and avast thy chase for a booty of pirate party ideas are right here. For all sea dog pirates searching for treasure of party ideas! Fairy Party! So your daughter is living in a fairyland of sorts and is ready to grow wings and take a magical flight? Get ready to start sprinkling the pixie dust because it's bound to help get this party ready. 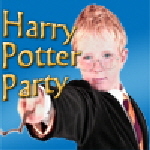 Harry Potter Party! Alohomora... Expecto Patronum! It’s time for all muggles to join Harry and sit for a spell.